5G and Internet of Things: A Trojan horse | "Global Possibilities"
The telecoms say this is the most efficient way to ease the digital congestion caused by audio-video streaming, whose global traffic, according to American giant Cisco, will be 11 times higher in 2018 than in 2014. Data would move through fibre optic cables, but rather than bringing these cables to your home, the last leg of the data’s journey would generally be wireless. As markets work, personal mobile phone subscriptions are more profitable than the higher speed fibre optic connections linked to desktops through your own router. The 5G network would also support the huge increase in wireless communications created by the Internet of Things (IoT). Since most people already own a cellphone, industry wants to expand its market by embedding a cellular microchip into most manufactured goods. Therefore, items purchased in the future would generate data to be collected by companies and, ultimately, by governments. 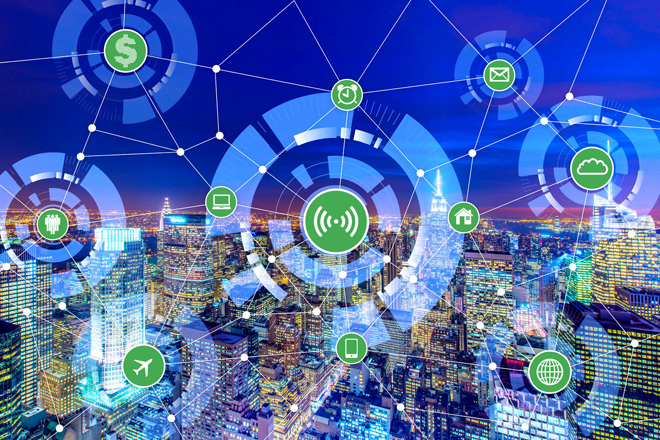 5G-IoT is promoted by the promise of “smart” cities, leading to a more comfortable, convenient, and efficient life. But besides a relentless expansion of sales, 5G-IoT will strengthen mobile phones as a platform for publicity and population control. Further, 5G-IoT deployment carries significant health risks. On September 13, 2017, 180 scientists and physicians from 35 countries signed a call to action demanding a moratorium on 5G deployment until its radiation levels are proven safe, particularly for children and pregnant women. Indeed, all these inter-connected objects would significantly increase radiation from electromagnetic fields (EMF) in our environment. And yet, aware of the enormous potential of this market, engineers managed to have these radiations characterized harmless, through 50 years of sustained efforts, by infiltrating and monopolizing standardization committees. Don’t worry, they say, if the International Agency for Research on Cancer, a branch of the World Health Organization, classified low- and high-frequency electromagnetic fields as “possibly carcinogenic to humans” in 2001 and 2011, respectively. Don’t worry that a study funded by the US National Toxicology Program confirmed the causal link between brain cancer and cellphone use. Ignore, they say, thousands of scientific publications documenting since the 1960s the harmful effects of chronic, low level exposure to microwave radiation, including more recent studies included in the 2007 and 2012 BioInitiative Reports. Forget also that these radiations have been linked to diabetes, lower human fertility, cardiac disturbances, several neurological diseases, and genetic changes. And forget about people suffering from electrohypersensitivity, forced to relocate to isolated regions because they suffer from “microwave illness,” a term coined by the Soviet military in the 1950s. Electromagnetic intolerance is an occupational disease whose symptoms disappear in non-electrical environments, concluded the Nordic Council of Ministers in 2000. EMF health risks were even highlighted in the March 2016 issue of IEEE Power Electronics, the magazine of the Institute of Electrical and Electronics Engineers. Constantly denied by the wireless industry, these facts constitute an inconvenient truth, as Al Gore would say. The telecommunication industry’s hold on federal governments is such that deployment of 5G-IoT networks is imposed and violates the rights of other jurisdictions, as well as individuals. Any debate about health risks caused by EMFs is forbidden during public hearings on cell tower sittings. You will be inevitably exposed to this radiation and even more so by goods fitted with transmitting chips. It is to prevent such abuse that California Governor Jerry Brown recently vetoed Bill 649, which would have prevented the State’s cities and counties from deciding on 5G antenna sitting. In 1942, renowned biochemist and futurist Isaac Asimov coined the Three Laws of Robotics, at a time when the influence of robotization was barely beginning. The first law was: “A robot may not injure a human being or, through inaction, allow a human being to come to harm.” As we enter the 5G-IoT revolution, should we not consider similar guidelines? Technology should not injure human beings, especially when alternatives such as optical fibre are available. Living organisms have tolerance to natural electrophysiological activity, but not to any of the artificial EMFs created since the 19th century. Nature cannot protect itself from pulsed and modulated microwave radiation with carriers oscillating billions of times per second. In 1984, George Orwell’s novel, society becomes a supposedly benevolent state offering comfort, practicability, and efficiency. But everyone is spied upon and monitored by a sophisticated communications system that constantly reminds people that Big Brother is watching. This book illustrates the abuse of power and the erosion of civil liberties caused by mass surveillance. Without limits, technology may supersede humanity, and that process is already underway. As Marshall McLuhan put it, “the medium is the message”; unlimited deployment of new technology often creates disastrous and unpredictable consequences, and 5G-IoT networks and products are very likely to do so. In 2018, the Orwellian prophecy comes true, 34 years later than predicted in the book 1984, which was published in 1948. Any type of automation reduces human autonomy and the powerful often abuse their privileges. The US Federal Communications Commission’s recent decision to repeal the rules that regulated Net neutrality, allowing companies to reduce the transmission speed of some data compared to others, illustrates this point. In the book 1984, the government monopolized information while now, with 5G-IoT, corporations wedge themselves in information control. Failing a revolution, it is often difficult to recover any rights and freedoms abandoned in the past. The cellphone has proven useful as a communication tool, but there is no need to expand it beyond its capacity to transmit short voice and text messages. The industry would like us to download 3D movies on the move, so justifying a 5G network. But this is going in the wrong direction. To prevent a public health crisis, the density of microwave signals must, on the contrary, be reduced by 10,000 times if not more. 5G intends to turn smartphones into mobile entertainment and visual stimulation centres purely for commercial reasons. 5G has no real strategic value. You can’t use a smartphone to design a commercial airplane. A more useful investment would be to connect the optical fibre network directly to users. Everyone could enjoy a communication speed ultimately 10,000 times faster than wireless, less vulnerable to hacking and harmless to the health of humans and other species. Casual link between brain cancer and cellphone use. Harmful effects of low-level exposure to microwave radiation. IEEE Power Electronics, March 2016 issue. California Governor Jerry Brown vetoes Bill 649. Paul Héroux is a PhD in physics, and a scientist with 15 years of experience in physics and engineering, and more than 30 years in the health sciences. He began his research career at the Hydro-Québec Research Institute in Varennes. After taking additional training in biology and medicine, he became professor of toxicology and the effects of electromagnetism on health at the Faculty of Medicine at McGill University, where he directs the Health Program. He leads the InVitro Plus Laboratory of the Department of Surgery at the McGill University Health Center, where he made an important discovery on the effects of electromagnetic fields on cancer cells. He devoted a chapter on this topic in the 2012 edition of the BioInitiative Report, an important synthesis on the health effects of electrosmog.